The waiting is finally over and the cultural phenomenon that is the John Lewis Christmas ad launches today. John Lewis of Hungerford that is. TMW Unlimited is proud to present the new Christmas ad it has created for British kitchens, bedrooms and furniture retailer John Lewis of Hungerford. And while this John Lewis ad is full of the heartstring-tugging, tear-jerking spirit of Christmas, this time there’s not a penguin in sight. 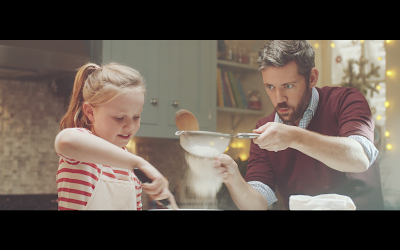 The ad is set in a kitchen at Christmas time as a dad and his young daughter set about making Christmas cupcakes. But while the cupcakes dad makes are perfect looking enough for Bake Off, his daughter’s efforts leave a lot to be desired. She presents her grotesque creations proudly to her mum, who does her best to look impressed, but as the girl skips off, mum quickly puts down her cupcake and eats one of dad’s instead. The ad, which focuses on John Lewis of Hungerford’s handcrafted kitchens, has the endline: “Imperfection not tolerated”. The 50-second film launches online today, Monday, November 2nd. The ad was created by TMW Unlimited and the production company was Mind’s Eye.